Are you wanting to try out some new trails with your Jeep 4×4, but aren't sure where to start? Driving the back trails with your Jeep can be an exciting experience, and you'll be able to explore parts of nature that remain unseen from the open highways. If you live in Tehama County, California or plan to take a trip there soon with your Jeep 4×4, you can use the information below to find some great trails. Remember to be careful, take every trail slowly until you become familiar with it and always be prepared in case of emergencies. Barge Hole – Short and sweet 2.0 mile long trail. This one's great for testing your jeep before taking the longer trails! There's a deep water crossing, so take it slow. Spring is the best time to go while the river's full and the vegetation is lush. The trail runs off of Jelly's Ferry Road. Colyear Springs Road – This 8.6 mile trail offers quite a few hills to climb for a great challenge. It's a play area where many try out new feats, and also has some beautiful scenery. This trail runs off of Lowry Road. Dehaven Gulch – An 8.0 mile trail that's located among some other popular areas. The trail offers quite a few side trails to take for adventures. Obstacles such as dry creek beds and several rock piles make this an interesting challenge. The trail is located off of Hogsback Road. Facht Hill – A trail with some difficult spots. It's a dusty trail with high fire danger, so be careful. Facht Place is your ultimate destination, where you can explore Antelope creek before returning to Hogsback Road. This trail runs off of Tuscan Springs Road. Forest Service Road 17 – A 21 mile long trail that's actually a dirt road "highway" style. Almost any vehicle can travel this one if there's no snow. This trail is east on Highway 36 from Red Bluff and goes to Mineral. Grapevine Jeep Trail – A great trail near Fischer campground with packed dirt surfaces and plenty of rock. This trail can be found by driving to Facht Place and crossing the Antelope Creek. It's approximately 5.5 miles past the area. Inskip Hill – This trail's fantastic for the person looking for fun and adventure. The Inskip Caves are located near the beginning of the trail, which runs off of Lanes Valley Road. Lake McGowan – A beautiful drive when there's no snow. Trail leads to a waterfall and Lake McGowan. The trailhead is just past the city limits of Mineral, past Battle Creek on the left. Massacre Flats – A nice short trail with gorgeous landscape in the spring. Takes around an hour to drive completely through. The trail can be found while driving through Bend until it changes over to a dirt road. Turn right at a sign that says "Shooting Range and Massacre Flats". North Ponderosa – A great trail which is carved from the side of a cliff, and has some wonderful views and unique terrain. There are some pretty difficult obstacles on this one. You can reach the trail by turning right onto Forward Road from Manton, and then right at Ponderosa Way, which is the trailhead. heights, this one might not be for you! When you reach the top of Peligreen Jeep Trail, you'll enjoy some lovely scenery. This trail is located off the only exit in Paynes Creek. The trailhead is approximately 20 miles out. Rat Trap Ridge – Great trail when there's no snow, with mostly ruts and some small hills to climb. There's a campground there too. There are five routes that begin at Tedoc Gap, and you'll take the one to your right which goes up the hill. Red Bank Creek – A trail full of rocks and fun terrain. It's usually not possible or very difficult when the creek is full because the trail runs back and forth over the creek. Red Bank Road is off of Live Oak Road, and you'll travel as far as you can or until you reach a dead end. 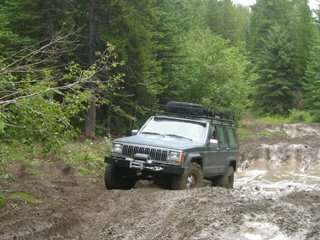 Section Jeep Trail – This trail is short with rock piles and great views of cliffs in a canyon. The end is at a ridge that sits above two creeks. The trail runs off of Oak Creek Road, about 2/3 of a mile on the right, and it's called Section Jeep Trail. Tomhead Mountain – A long trail with 31 miles of dirt road leading up to a summit. The trail goes up to 6147 feet in eleven miles from the foot of the mountain. Great for hiking and exploring! There's a campground also called the Tomhead Saddle Campground. difficult, and might not be best for beginners. There's a lot of flooding during heavy rain storms. The trail can be found by taking exit I-5 at Highway 36 and Antelope. Go west and take the right into the FoodMaxx shopping center. Go all the way back to reach the dirt and follow along the freeway until you reach the river, then turn right. These trails are fun, adventurous and full of great obstacles to test your 4×4 skills. Take your Jeep for a spin if you're in the area.